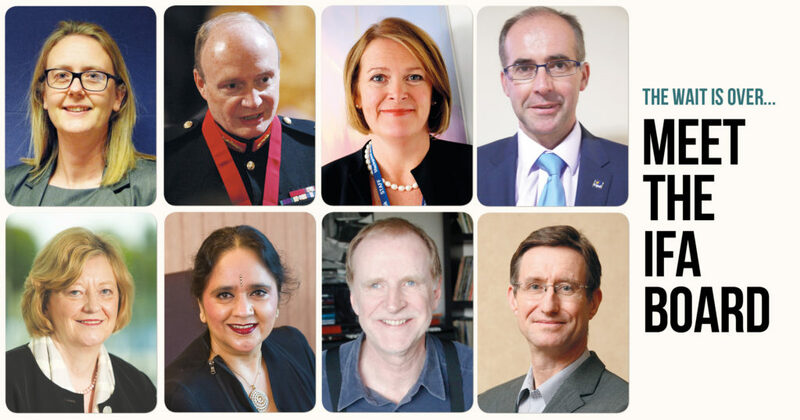 The government has finally announced the eight Institute for Apprenticeships board members (listed below), with the chair to be confirmed at a later date. This will come as a relief to the sector after FE Week’s front page last week reported concern that the government remained silent on board members and other permanent leadership posts, under three months before the Institute become “fully operational”. 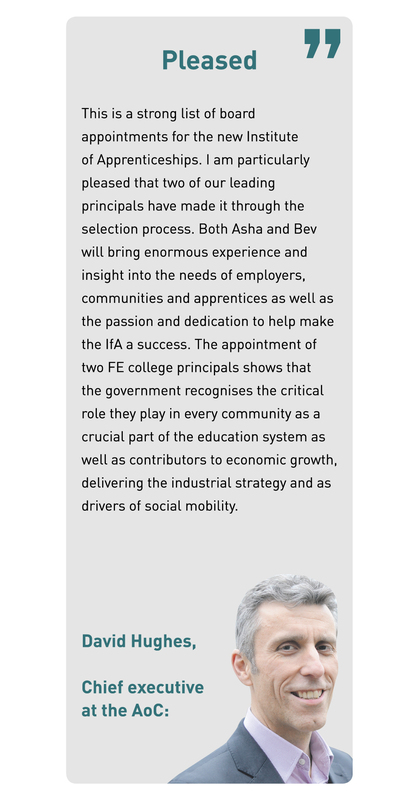 The Department for Education advertised for paid board members last June, and they comprise of a majority of employers as planned, but two are serving college principals. This has been welcomed by chief executive of the Association of Colleges David Hughes, but the immediate response from the independent training provider sector was one of disappointment that it is not represented (see quotes below). FE Week can also reveal that the first deputy director for the new apprenticeships policing body has been appointed. Anastasia (Ana) Osbourne, formerly employed in the Enterprise Directorate at the Department for Business, Innovation and Skills, was introduced as the IfA’s new ‘deputy director of approvals’, to an audience of over 100 delegates at a private Trailblazer Conference. The conference, which was run by the Department for Education, took place in Birmingham and was attended by employers who have been designing apprenticeship standards. According to the Department for Education’s deputy director job pack, the deputy director of approvals will carry out four main functions. Ms Osbourne will be expected to “coordinate and support the operation of the approvals process for apprenticeship standards and technical education standards”. She will also “work with route committees and others to ensure excellent quality assurance practice governs the approvals process including induction, standardisation, monitoring, review, risk assessment and feedback mechanisms”. Finally, her position awards her responsibility for building “effective relationships with stakeholders” and working with “analysts and others to develop occupational maps”. The Department for Education biographies for the Institute for Apprenticeship board members did not identify anyone from an independent training provider. However, FE Week has subsequently been made aware that Paul Cadman is chief executive of Crosby Management Training. Crosby Management Training does not have a direct contract with the SFA, but does subcontract from Dudley College and Walsall College, through contracts worth £281,380 combined. AELP told FE Week this morning that its criticism of the weighting of appointments towards colleges, and not ITPs that are direct providers, still stood. The absence of representation from the independent sector urgently needs to be addressed. This is the sector which is delivering the most apprenticeships and will continue to do post Levy introduction. Well said Mark Dawe… again ! One can only assume that this was a cunning plan to exclude both the training providers who currently support most apprentices in training and those employer sectors which account for the largest number of apprentices. Oh ..and they don’t want to hear from SME employers either apparantly! While I believe that the institute is a good idea, this seems like a bit of a missed oportunity. It is not a very diverse panel and the make up of it are people who have been around their various sectors for a long time. As has been mentioned their are no private training providers and a lack of younger people who may have a different perspective on apprenticeships. This looks like a highly experienced set of Board members. I wish them well with their important work. Let’s hope careers education, information, advice and guidance features on the agenda. Signals to young people and parents about the changing work of work remain very weak. Same old same old. Jobs for their mates. Too many FE colleges not enough of the real deliverers of Apprenticeships, the Independent Training Providers. No doubt everyone at FE Week are chuffed to be bits. Have to agree with some of the comments made. There is lack of representation from independent providers who cater for a large proportion of Apprenticeships. Also no young people on the board who may or may not have first hand experience of apprenticedhips. Whilst representatives on the panel may have experience in their own field we need the board to reprevent all those involved in Apprenticeships particularly independent providers. I believe that the term ‘apprentice’ has been hijacked and is now being used to validate otherwise misguided training schemes. Government statistics show that the vast majority of ‘apprenticeships’ which currently recognised are not in either Engineering or Construction sectors, nor are they all for under 21’s. Let us be sure that an apprenticeship is worthy of its name, and not a ‘dressed up’ training scheme. Are these elected people capable of that or are they too academic?